For over 50 years, Oran Ltd has been manufacturing superior aluminum and UPVC products that have protected Barbadian homes and businesses alike. 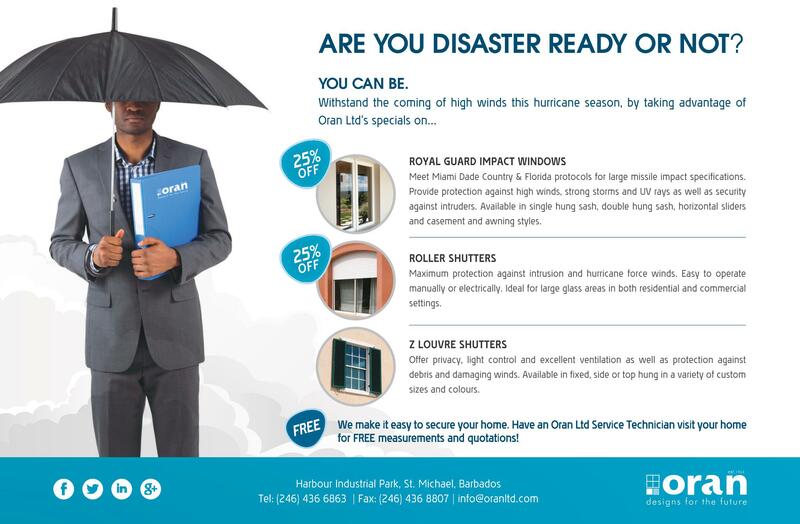 Your biggest investment is never more vulnerable than during the months of the hurricane season but Oran Limited is helping Barbadians get disaster ready with specials on select hurricane products – Roller Shutters and RoyalGuard Impact Windows. 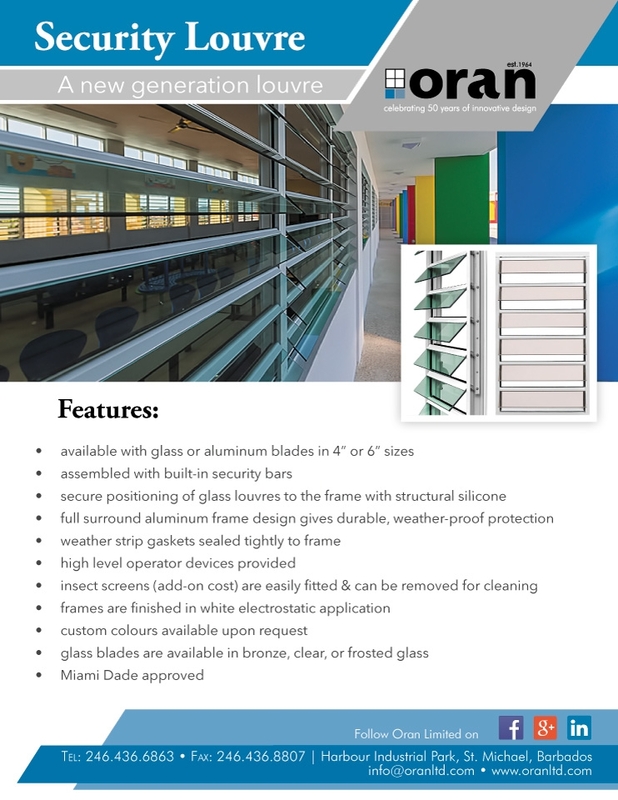 Oran Limited’s Roller Shutters offer maximum protection against both intrusion and hurricane force winds. Easy to operate both manually and electronically, Roller Shutters are ideal for large glass areas in residential and commercial applications. Other benefits include sun shading and privacy. RoyalGuard Impact Windows meet Miami Dade Country & Florida protocols for large missile impact specifications. For a window to be considered “Impact Certified”, it must successfully survive the impact of a 2” x 4” timber being shot at the window from a cannon under laboratory conditions simulating that of an actual hurricane. The glass will break, however, it will stay within the window frame due to a combination of structural silicone and laminated interlayers that hold the glass securely. RoyalGuard Impact Windows offer the security of knowing that one’s home or business is always protected without the hassle of taking temporary security measures with every hurricane or storm warning. Also available are the aesthetically pleasing Z Louvre Shutters, which offer privacy, light control and excellent protection against debris and damaging winds. Z Louvre Shutters are available in fixed, side or top hung styles in a variety of custom sizes and colours. Oran Limited is making it even easier to get disaster prepared this hurricane season with its complimentary Measure & Quote service. 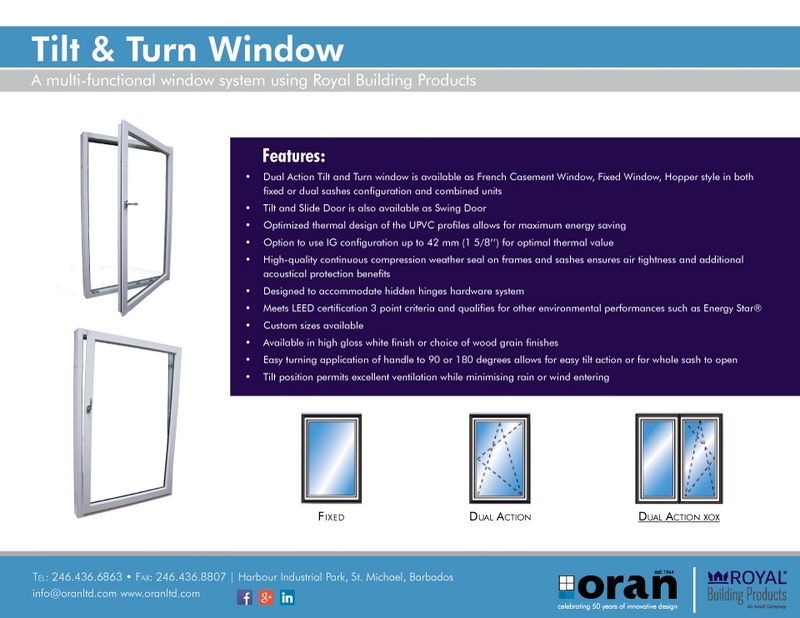 Call 436 6863 to have an Oran Ltd Service Technician visit your home or business today!